The quantitative scenario study on the EU energy system focuses on the security of energy supply and different alternatives for the EU energy system. Five different scenarios for the EU25 energy system by 2030 were developed. The scenarios were then grouped into two main families called “advanced conventional” and “domestic action” and their respective pros and cons analysed with regard to all relevant EU-policy fields for providing policy recommendations. large energy importing economies (i.e. China, India) can be expected to intensify international competition for market access to the declining resources and, ultimately, may also generate international conflicts. greenhouse gas emissions, which essentially means using less energy and switching to carbon neutral energy carriers. a range of possible future energy solutions for the EU25, five different scenarios have been developed according to the strategies and targets requested by the European Parliament’s Committee on Industry, Research and Energy (ITRE). In order to draw different possible futures of the EU energy system, five scenarios based on two main sources were designed. The basic data, economic assumptions and the main results for the BAU scenario were derived from the latest available EU energy and transport projections (Decker 2006, Mantzos 2006, Mantzos & Capros 2006). Demand-side projections and analyses of higher penetrations of energy efficiency and renewable energies were derived from a recent scenario analysis by the Wuppertal Institute (Lechtenböhmer et al. 2005a/b). The quantification and combination of potentials, costs, strategies, policies and measures, and the calculation of scenarios were carried out using the Wuppertal Scenario Technique. In the business as usual (BAU) scenario, the continuation of energy policy trends would already lead to a strong primary energy efficiency increase within the EU25. However, this increase would not be sufficient to compensate for growing GDP. As a consequence, primary energy demand would increase by almost 15% and import dependency by more than a third. Due to an increased share of renewable energy sources (RES) and a switch to natural gas, CO2 emissions would increase by only 3% to 6.6%, depending on the nuclear energy policy. With regard to climate policy, it is assumed in the BAU scenario that the EU25 will accept international emission reduction targets for the commitment periods after 2012 of 15% by 2020 and 30% by 2030. The N+ scenario – as defined in accordance with the request by the ITRE committee – is a variant of the BAU scenario based on the expansion of nuclear energy (thus N+). While in the BAU scenario nuclear capacity declines by 28% from 141 GW (2000) to 101 GW in 2030, in the N+ scenario the construction of about ten more new nuclear power plants of 1300 MW each is assumed, which would result in a nuclear capacity of about 126 GW in 2030 – or 25% more than in the BAU scenario. CO2 emissions in power and steam generation decrease by about 6.6% vs. BAU by 2030, whereas total emissions from the EU25 decrease by 1.9%. Furthermore, this scenario also includes the use of carbon capture and storage (CCS), which can further reduce CO2 emissions, albeit fairly modestly in the case of the EU (another 6%~7% of the power sector emissions compared to BAU). The N– scenario marks the other end of a range of possible nuclear energy BAU scenarios. Power plants are assumed to perform less well in this scenario and this, together with waste issues and a stronger perception of the risks of nuclear energy, combines to increase the pressure on plant operators. Consequently, no new nuclear power plants are commissioned and a in 2030. In total, CO2 emissions in this scenario would be at a level of 72 million tonnes, or 1.9%, more than in the BAU scenario by 2030. The energy efficiency (EE) scenario assumes strong policy at EU level, as well as within the member states, targeted at accelerating the rate of increase of energy efficiency in order to reach a level of energy efficiency 50% higher than in the BAU scenario by 2030. This means that energy efficiency (GDP per ktoe primary energy use) would increase by 2.2% per year and reach 10.5 MEur/ktoe in 2030 (BAU: 8.5). The renewable energy expansion (RE) scenario describes a restructuring towards a renewable energy system with a target of approaching a renewable energy supply as high as possible by 2030. To achieve such a high share of renewable energy, the scenario combines an even stronger drive towards energy efficiency (11.9 MEur/ktoe by 2030) with an accelerated expansion strategy of renewable energies, which reach a share of 31% of total primary energy supply in 2030. This strategy depends on the feasibility of the projected 34% share of fluctuating energies (wind, hydro, solar, tidal and wave) in the electricity system and on the feasibility of accelerating energy efficiency improvement to 2.7% per year. The five scenarios developed for the study have been analysed with regard to the core energy policy fields. Brief discussions on recent trends, followed by implications for policy needs with regard to the different scenarios, have been discussed for each scenario. The energy issues considered in this report interact directly and indirectly with many European policies, in particular the climate policy, the Lisbon strategy and the external (energy markets) policy, which do not focus exclusively on energy but function as framework policies. These policy areas with wider scope can significantly influence the feasibility of potential pathways for the development of the energy system. In addition to these crosscutting policies, the following key energy policies are touched upon in the study: single European energy market, energy efficiency, renewable energies and energy technology policy. are, to some extent, favourable to global stability but, on the other hand, also need global political stability. pressure on external supplies to the EU due to decreased imports, while offering additional options to mitigate the worldwide depletion of fossil resources. CHP in district heating and industry. Grid investments for electricity would be expected to be near the upper limit of the above-mentioned numbers, while those for natural gas would approach the lower end. Investments for new power generation would be 20% lower in the EE scenario than in the BAU scenario and 10% lower in the RE scenario. In the RE scenario the effect of much lower capacity is partly offset by higher cost per kilowatt installed. Furthermore, investment would be completely different. While even in the BAU scenario investments in new CHP and renewable capacities are projected to overtake investments in fossil and nuclear generation, the latter will stand in the EE scenario for only 20% of total investment and in the RE scenario for less than 10%. energy use by affecting end use prices, investment in new and efficient (CHP) generation capacity and the prospects for the introduction of demand side management policies. both current targets and ambitious targets for the future (20% in 2020, 35% in 2030) are achievable. However, the scenario also illustrates that these targets require a substantial restructuring of the whole energy system and economy by using the opening window of opportunity presented by the ageing energy system and its subsequent high reinvestment need. It appears that current policy for renewable energy – in spite of its impressive success – is not yet in a position to implement the changes needed for the realisation of this scenario. The scenarios discussed in this report can be grouped into two main strategies. The first type of strategy could be called “advanced conventional”. This route is described by the BAU scenario combined with the N+ scenario and specific greenhouse gas mitigation options of carbon capture and storage and, particularly, the use of clean technology transfer and other flexible mechanisms to achieve emission reductions outside the EU. The other type of strategy, “domestic action”, relies much more on the domestic potential of renewable energy sources and energy efficiency and seems to have the capability to adequately cope with both major challenges so that the risks emanating from these are significantly lower. Both strategies have crucial preconditions that may pose severe challenges to their feasibility. The advanced conventional strategy crucially relies on the successful implementation of an active foreign energy and technology transfer policy. Strong international competition for energy resources may become an increasing threat for this crucial foreign policy link. However, this scenario would carry less risk with respect to the management of change inside the domestic European society, since changes tend to be less radical than in alternative scenarios. The domestic action strategy, on the other hand, would swap, to some extent, the external threats from climate change and geopolitical turmoil for bigger challenges with respect to the management of the more radical changes inside the domestic European society (i.e. within the EU and its member states). More specifically, this strategy would stand or fall on the successful restructuring of the EU energy system and the bulk of all investment decisions. In spite of the diverging, and at least partly mutually exclusive, directions in which energy policy could steer (energy) policy choices, there are a number of policy actions that would be required in any strategy and which differ only in terms of intensity. Consequently, these policy areas should be given high priority for securing energy supply regardless of the strategy prioritised. The first strategy is enhancing demand side energy efficiency including cogeneration. The next robust option concerns renewable energies. All the scenarios assume high increases in this area as well, particularly in wind power generation and biomass use. What is more, some policies are already partly in place and the current targets on the EU level already correspond to a very ambitious RE scenario, but need to be supported by stronger policies and expanded by 2020 and 2030. In the energy market overall, and taking into account the efforts being made to enhance energy efficiency, it is also important that retail pricing of electricity appropriately reflect its scarcity and emission impacts on the wholesale market. Robust steps towards a future EU external energy and climate policy include the fostering of clean development and clean technology transfer, as this will strengthen international relations, partly relieve demand pressure on energy markets, create additional or strategically needed emission credits and expand markets for renewable and efficiency technologies, which would, in turn, support the domestic development of these technologies. Investigacion Tecnologica, Mercados Energeticos, Ramboll TENEnergy Invest. Decker, M. (2006): New (2005) Energy Baseline, Presentation to National Emission Ceilings and Policy Instruments Working Group, Meeting on 1. 2. 2006. Lechtenböhmer, et al. (2005a): Target 2020, Policies and Measures to reduce Greenhouse gas emissions in the EU, Scenario analysis on behalf of WWF-European Policy Office, Wuppertal, Brussels. Lechtenböhmer et al. (2005b): Energy efficiency as a key element of the EU’s post-Kyoto strategy: results of an integrated scenario analysis. In: Energy savings: what works & who delivers, ECEEE 2005 Summer Study Proceedings; volume 1. Stockholm: Europ. Council for an EnergyEfficient Economy, 2005, p. 203-212. Lechtenböhmer et al. (2006): Security of Energy Supply – The Potential and Reserves of Various Energy Sources, Technologies Furthering Self Reliance and the Impact of Policy Decisions. Study on behalf of the European Parliament. IP/ITRE/ST/2005-70. Lechtenböhmer et al. 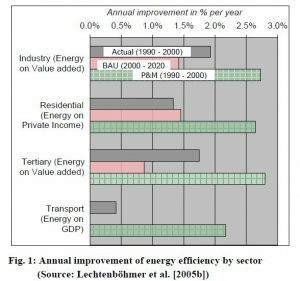 (2007): The Blessings of Energy Efficiency in an Enhanced EU Sustainability Scenario. In: eceee 2007 Summer Study Proceedings: Saving energy – just do it! 4-9 June 2007. La Colle sur Loup, France. ISBN 978-91-633-0899-4. Mantzos, L. (2006): PRIMES model of scenario results for the EU25, NEC-PI Meeting, July 2006, Brussels. Mantzos, L., Capros P. (2006): European energy and Transport. Scenarios on energy efficiency and renewables, Ed. : DG TREN, Brussels. An integrated quantitative scenario analysis was conducted to elaborate, describe and evaluate strategies and paths for the European Union to achieve significant reductions in domestic greenhouse gas emissions by 2020. The objective of the foresight exercise was to support EU wide consensus formation, to assist in priority-setting, and to help raise awareness with regard to policy, industry or society as a whole. How to Reach EU Targets on Green House Gas Emissions? The EU has committed itself to limiting global warming to a maximum of 2°C average temperature increase above preindustrial temperatures (Council 2005). According to most recent research, keeping within this threshold requires that global green house gas (GHG) emissions be cut approximately in half by 2050 (Hare & Meinshausen 2004). In fact, global emissions will have to peak and decline in the next one to two decades for temperatures to stay below the 2°C threshold. This consequently indicates that industrialized countries will have to reduce their GHG emissions by approximately 60-80% by 2050 in order to leave room for legitimate economic growth and ensuing higher emissions in developing countries (European Commission 2004). In addition, some developing countries will also need to commit to taking steps toward a less carbon intensive development strategy. To achieve this challenging goal, rapid action is needed. Future commitment periods under the Kyoto Protocol with a likely time horizon of 2013 to 2017 and 2018 to 2022 will thus need to see substantial reduction targets by developed countries. This will be a precursor of further action and commitments on part of developing countries. In January 2005, the European Parliament emphasized “the necessity of significantly enhanced reduction efforts by all developed countries in the medium term to be able to meet the long-term emission reduction challenge”, which it quantified for industrial countries “of the order of 30% by 2020” and “of 60-80% by 2050”. It also called on the EU “to adopt reduction targets at the 2005 Spring European Council which are in line” with these objectives (European Parliament 2005). The European Commission in its communication ”Winning the Battle Against Global Climate Change” supported the necessity to limit temperature increases to a maximum of 2°C worldwide compared with pre-industrial levels and confirmed its will to take international leadership towards combating climate change (European Commission 2005). It also documented the relatively low economic costs to do so without even calculating the expected benefits from emissions reductions. Against this background, WWF commissioned the Wuppertal Institute to conduct an integrated scenario analysis of GHG emission reduction potentials of the EU 25 for the year 2020. For this purpose, the Wuppertal Institute developed a strategy scenario called the “policies and measures (P&M) scenario”. This scenario relies on a baseline derived from the energy and transport projections for Europe (Mantzos et al. 2003). Its strategies and assumptions are based on evaluation and extrapolation of detailed analyses in all sectors, for many countries, and for important energy-using goods and appliances. The most relevant studies were selected for this purpose. The Business-as-usual (BAU) scenario assumed policies with no special emphasis on climate protection and energy issues, neither with regard to additional policies since 2003 specifically designed to meet the Kyoto Protocol targets nor to rising energy prices and increasing concern about limited resources. The BAU scenario is mainly based on the data and assumptions made in the most recent energy projections for Europe (Mantzos et al. 2003). In the P&M scenario, existing cost-effective potential for increasing energy efficiency is exploited and ambitious targets for market penetration of renewable energies are actively pursued. In addition, a switch to less carbon-intensive fossil fuels, such as natural gas, and effective policies and measures to mitigate the exploding demand in the transport sector are assumed under the P&M scenario. The P&M scenario includes a moratorium on new nuclear power plants and compliance with the nuclear phase-out schemes in the respective countries concerned. Quantification and combination of potential, strategies, policies and measures, and the calculation of scenarios were conducted using the Wuppertal scenario modelling approach. The modelling technique uses a technology-oriented, sectoral bottom-up approach. Reflecting its relevance for GHG emissions, the energy sector is modelled in greatest detail, using appliance or end-use specific sub-models for each demand sector (households, tertiary, industry, transport) and a purpose-oriented model of the transformation sector (cp. Fischedick, Hanke and Lechtenböhmer 2002). GHG emissions in the energy sector are calculated based on the final and primary energy balance. CH4 and N2O emissions in the energy sector are calculated by subsector, using a simplified approach based on current sector-specific emission factors. Other sectors and greenhouse gases are covered by specific sub-models, which are adapted to the currently limited information available for these sectors. The modelling technique applies a heuristic (i.e. expertbased) approach in order to identify potential, to formulate strategies, and to estimate market penetration rates of new technologies, market shares of fuels, etc. 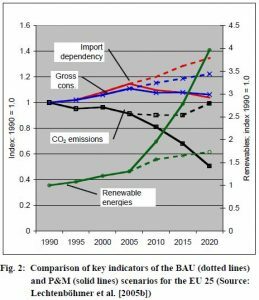 Although the BAU includes considerable energy-efficiency improvements in all energy-consuming sectors, increasing renewable energy shares and a decoupling of gross energy consumption growth (+0.7% p.a.) from GDP growth (+2.4% p.a. ), no reduction of GHG emissions from energy use can be achieved by 2020 under BAU conditions. On the contrary, CO2 emissions from fuel combustion are expected to increase by 10% compared to 2000 levels. These results highlight the fact that with the existing EU climate policies the Kyoto targets for the first commitment period (ranging from 2008 to 2012), which aim at a reducing emissions of six gases by 8 % compared to 1990 for the EU 15 and slightly lower reductions for the new member states, will not be met even if further greenhouse gas emission reductions in other sectors and gases are taken into account. Tougher long-term targets for the following periods up to 2020, which are crucial for mitigating climate change, seem to be even more out of reach with BAU policies. To explore how the BAU development could be redirected toward a more sustainable course, a sectorally disaggregated high efficiency scenario was developed for the EU 25. The P&M scenario includes policies and measures specifically geared toward enhancing emissions reductions. Supplementary to the high efficiency strategy, a renewable strategy is outlined which is based on the medium-term potential for renewable energy within the EC (European Commission 2004) and can be expected to produce substantial additional emissions reductions. The P&M scenario describes an ambitious energy efficiency strategy, which covers all demand sectors and is projected to lead to final energy savings of about 22% versus BAU by 2020. This would mean stabilising final energy demand at about current levels. Combined with a similar strategy to boost the use of renewable energies, their share could be increased to 21 % of total primary energy supply and about 37 % of electricity production in the EU 25 until 2020 (BAU: 7.15 % / 7.32 %). These two effects – stabilising energy consumption through energy efficiency at all levels and maintaining domestic production by increased production of renewable energies – will not only allow to reduce domestic GHG emissions by more than 30% but at the same time will enable to bring the trend toward increasing import dependency to a halt. Domestic energy production would be able to deliver about half of European energy consumption. This means that economic and ecological risk minimization can be achieved. As compared to BAU, the P&M scenario will reduce risks and potential costs of climate change as far as possible as well as other environmental damages incurred as external costs of energy supply. In order to change the course from BAU trends, which lead to increased energy demand, greater dependency on foreign resources, and accumulating risks, towards a sustainable energy strategy, a comprehensive policy package is needed. Combining the EU emission trading system with a comprehensive set of sector- and technology-specific policies and measures for energy end-use and supply efficiency, such as combined heat and power (CHP), and electricity generation from renewable energies has to play a leading role, as the emission trading scheme covers sectors that are expected to account for about 60 % of total emission reductions in our P&M scenario. Consequently, national caps have to be set to ensure an overall 2.8 % per year decrease in emissions. Strong policies and measures for transport, for energy efficiency, in support of thermal uses of renewable energies, CHP heating and housing renovation. The study concludes that an integrated and active climate protection strategy for the EU is not only necessary in order to mitigate impending global climate change but is also feasible, as such a strategy would spur the EU economy to accelerate improvement of energy efficiency and to adapt power systems to renewable energy supply. Furthermore, it represents an approach suited for minimizing risks, not only of global warming but also of disruptions in energy supply and of increasing energy prices. 2005), is achievable when actively employing the available strategies. This makes clear that the necessary reductions of greenhouse gas emissions can be achieved by exploiting the potential for cost-efficient energy savings and expanded use of renewable energy sources. Another important result is that an active climate protection strategy yields further benefits in form of massively reduced risks of energy shortages and energy price peaks. It relieves the European economy from the burden of high energy costs and also reduces other environmental strains. The results show that the strategy described by the P&M scenario is superior to a “muddling through”, business as usual development with regard to quite a number of important economic and ecological variables. EU policy makers are well advised to further intensify and accelerate their efforts to speed up energy efficiency improvements in all sectors, to support further expansion of CHP, and to prioritise renewable energy sources in the necessary replacement of a large proportion of the European power plant stock. The study, published in summer 2005, was probably the first to draw a complete, though rough, scenario for the EU 25 in line with the target indicated by the European Parliament: a domestic reduction of GHG emissions by more than 30 % by 2020. In the P&M scenario, the study briefly sketched the general feasibility, the sectoral distribution, as well as the technology and the policy requirements for achieving more than 20% final energy savings versus BAU and expanding renewable energies to deliver more than 20% of EU primary energy supply. In so doing, the study already anticipated the key targets of the “triple 20” climate policy package adopted by the EU Spring Council in 2007. Moreover, it also gives evidence for the fact that energy savings of 20% compared to BAU and a share of 20% renewable energies have the potential to reduce EU 25 GHG emissions by about 30%, which is substantially more than the 20% the EU has so far decided upon. Council of the European Union (2005): European Council Brussels, 22 and 23 March 2005, Presidency Conclusions, 7619/05. Brussels: European Union. European Commission (2005): Winning the Battle Against Global Climate Change. Communication from the Commission to the Council, the European Parliament etc. Brussels. European Parliament (2005): European Parliament resolution on the outcome of the Buenos Aires Conference on Climate Change, P6_TA-PROV(2005)005. Fischedick, M., Hanke, T. & Lechtenböhmer, S. (2002): Wuppertal Modellinstrumentarium, in: Forum für Energiemodelle und Energiewirtschaftliche Systemanalysen in Deutschland (Hrsg. ): Energiemodelle zum Kernenergieausstieg in Deutschland, Heidelberg, p. 348 – 377. Hare, B. & Meinshausen, M. (2004): How much warming are we committed to and how much can be avoided?, submitted to EU’s stakeholder consultation on Action on Climate Change Post 2012. Lechtenböhmer, S., Grimm, V., Mitze, D., Wissner, M. (2005a), Energy efficiency as a key element of the EU’s post-Kyoto strategy: results of an integrated scenario analysis. In: Energy savings: what works & who delivers, ECEEE 2005 Summer Study Proceedings; volume 1. Stockholm: Europ. Council for an Energy-Efficient Economy, 2005, p. 203-212. Lechtenböhmer, S., Grimm, V., Mitze, D., Thomas, S., Wissner, M. (2005b) Target 2020, Policies and Measures to reduce Greenhouse gas emissions in the EU, Scenario analysis on behalf of WWF-European Policy Office, Wuppertal, Brussels, 90p. Mantzos, L. et al. (2003): European energy and transport trends to 2030, published by DG TREN, Brussels. The main aspiration was to gain strategic intelligence on future fuel technologies going beyond the current status and trends of present day energy technology and to draw roadmaps of selected future fuel technologies leading to robust plans for the future of technologies in the APEC region up to 2030. Moreover, the co-organizers of the project also anticipated continuous activities referred to as “post foresight” within APEC economies and among fuel technologies experts both during and after the project. The purpose of this exercise was to identify the main technologies that would influence the development of nuclear energy in Spain up until 2030. The picked up information is supposed to help to change the public opinion in Spain from a sceptic view towards a broader acceptance of the application of nuclear energy.